Even with subtitles, I probably would have fast-forwarded through vast stretches of this film; without them I spent much of my time bewildered by the plot and bored by its meandering. I might not have bothered to write it up either except for there’s an absolute dearth of material about it out there, and it does have some very redeeming qualities. 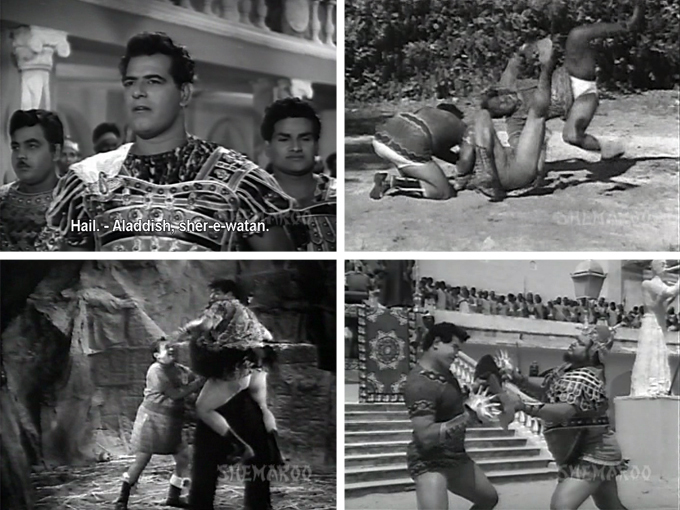 It seems to have had a decent budget: there are a lot of well-known character and comic actors; the costumes and sets are lush and colorful; Helen and Laxmi Chhaya each have dances. I suspect though I can’t confirm that none of the money lavished on it went to a script writer, however. Mohammed Hussain is a director whose name I am always happy to see in the credits, but he might have been rather worn out or bored himself by the time this was made. It lacks his trademark lunacy, and that craziness is sorely missed. Khair. Enough quibbling, let’s talk about the good stuff. Finally, someone has done what really needed to be done: written a book about my talented and gorgeous Indian mother Edwina and her background dancer friends, who appeared in pretty much every film from the 50s throughout the 1960s. She worked with all the greats from that era. Here’s a message from the author, Professor Surjit Singh, an avid film historian whose website I discovered early on as a treasure trove of information. As you know today (July 22) is her birthday. You will be pleased to know that on this occasion a biography of Edu has been published. The book is ‘Edwina: An Unsung Bollywood Dancer of the Golden Era’ by Professor Surjit Singh. For more information, please visit my website. If buying in Rupees, go to Pothi.com. I have read the book, and he begins with some really interesting information about the history of music and dance in Hindi cinema, and about the Anglo-Indians who worked in the industry from early on. He has included a lot of stories in Edu’s own words, and she as many of you know is very funny indeed. It’s a treat. Have a very very happy birthday, dearest Edu! I was telling my friend Suhan the other night that I have stopped writing reviews mostly because I felt like I was endlessly repeating myself, and my threshold for lunacy had become so ridiculous that very little made me sit up and say “OOOOH!” any more. But lately I have been missing my daily masala dosage, so when this Feroz Khan-Vinod Khanna starrer appeared on my radar I couldn’t resist it. 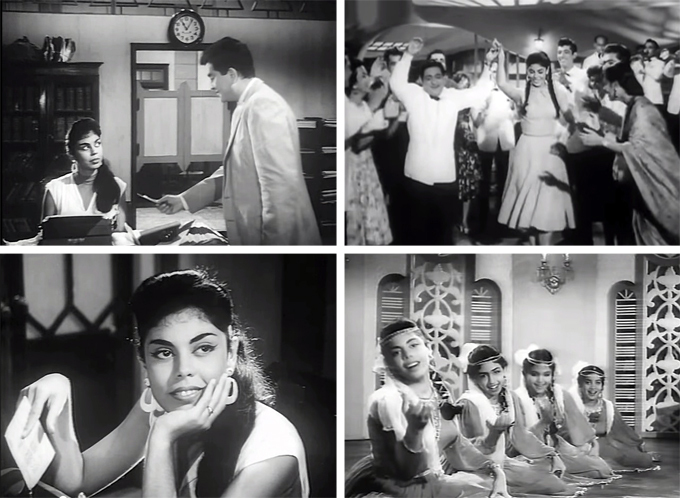 It is—not unexpectedly—a predictable and formulaic film, but it moves along at a fast clip thanks to relegating large portions of the action to narration by the characters (often to each other via telephone) after the fact (“Shankar and Shambhu have escaped from jail!” “We have kidnapped your daughter!”) instead of actually showing it to us, leaving details like “How?” “Why?” “Where?” and “When?” up to the viewer’s imagination. Screen time is largely devoted to Ornament with a capital “O”: a mish-mash of dacoit hideaways, corrupt rich people mansions dotted with crazy, and eye-popping disguises. This is okay with me. The story I can make up; the insane set pieces, wigs, and outfits not so much. 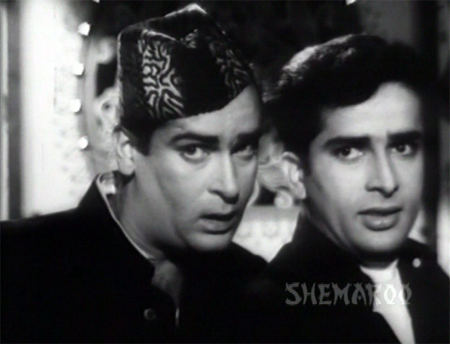 Way back when I wrote my “ten favorite qawwalis” post, someone pointed me to the one from this film (only available on vcd at the time) which features Shammi and Shashi Kapoor plus Bhagwan, Om Prakash, Kumkum and Shyama in guest appearances. So when the movie finally appeared on a dvd with subtitles I jumped at it. Of course one should perhaps be wary when the dvd cover expends much of its available space advertising the “Star Studded Qawwali” but never mind. I cannot resist Shammi. 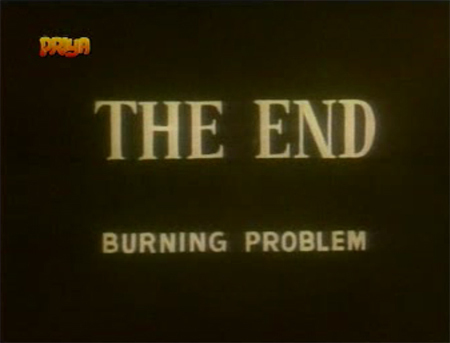 A burning problem indeed! Since I didn’t actually buy this (thanks Shalini! *mwah*!) I don’t have any idea whether Priya’s packaging warned the consumer to expect an abrupt cessation of events. I’m guessing not, though, and they fill in the last half hour with ads in case you are inclined to demand your paisa vasool, which I at least did not have to worry about. The situation does beg this question: am I glad I saw what I did of the film, even if I had no idea what was going on (no subtitles) and never did find out how it ended (burning problem)? The answer is a qualified yes: I am grateful for what is there, garish as it is, especially the songs by GS Kohli. They are fabulous. But I am also painfully aware that there will likely be no opportunity for me to ever see it as originally intended, all the way through. It is a sad loss indeed. 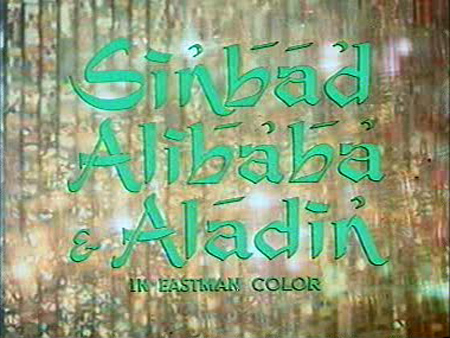 Previously, Sinbad has found a special sword (not that he’s really used it thus far) and Aladin has found a magic lamp complete with Genie Helen, but poor Alibaba (except for one brief moment) has nothing to show for our trio’s (or quartet’s, if you count Jameela) adventures. 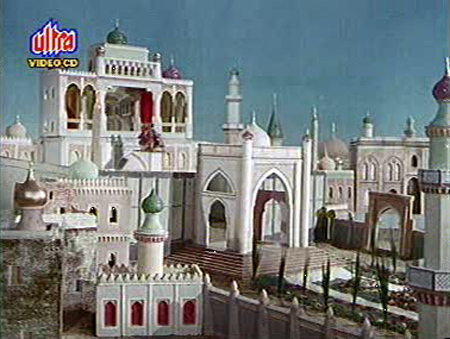 The end of our first installment saw Aladin passing out drunk at a restaurant in the desert, and Alibaba going off in search of Sinbad and Princess Jameela; elsewhere in the same desert, Sinbad is romancing Zarina (Minoo Mumtaz) for some unknown reason as Shyam Kumar tries to molest poor Jameela.